Vanderlin Island is located approximately 50km off the south west coast of the Gulf of Carpentaria at the point of the MacArthur River mouth. A processing works was proposed as a co-operative of mainly tableland owned properties, with it being exempt from taxes, shipping acts and all government fees. The intention being to process cattle but reintroduce sheep in large numbers across the tableland areas. Vanderlin Island is located 50km from the mouth of the MacArthur River on the South west edge of the Gulf of Carpentaria. proposed a formation of a chartered company to build an abattoir, freezing works and shipping facility on Vanderlin Island. Of this area 68,000 was under leasehold, remainder was planned to be developed. Cattle trucking experiments were being done in NSW, use of diesel transport and trailers would be only 23% of the cost of the railway line. From Borroloola the cattle would be transferred to Vanderlin in shallow-draft lighters similar to the picture below. Plan was strongly opposed by other producers. The abattoir was to provide a market for aged cows, scrub bulls and culls. Townsville district associations complained the facility would take shipping and general business from the town. Conacher (Vesteys chairman) forsaw a number of problems in relation to labour, supply, freight and supply of fresh water. Anderson approached AMP society for backing and other potential lenders – all refused. July 2014. Maronoa council is seeking $75,000 to conduct a feasibility study into the establishment of an abattoir to process beef, sheep and goats. Proposal is reliant on a new airport at Toowoomba currently being built, rail link improvements that are proposed to Miles and extension of the rail from there to Roma. 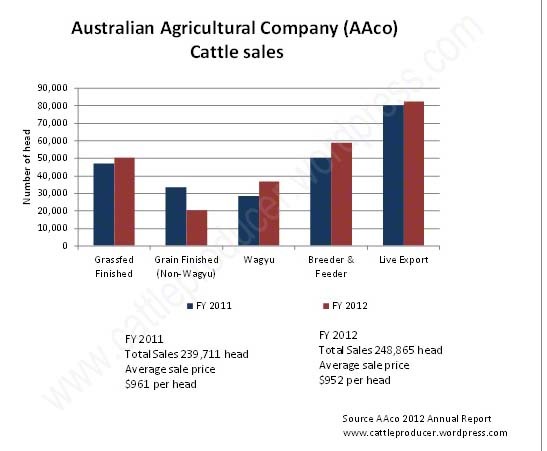 Australian Agriculture Company (AACo) is Australia’s largest beef producer owning in excess of 500,000 head. 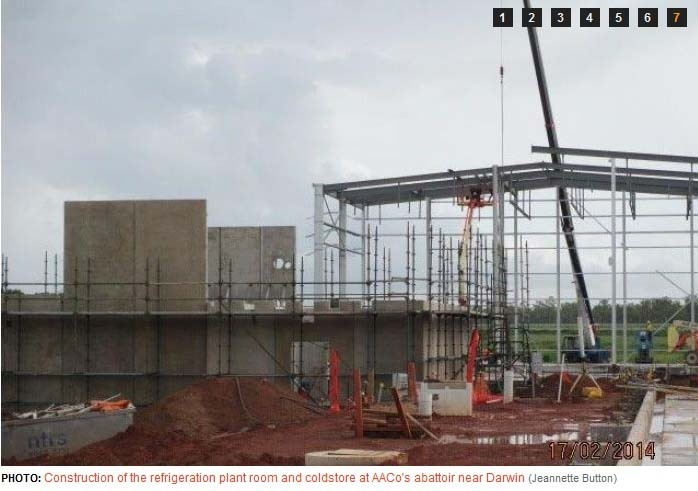 The building of the Livingstone beef processing facility near Darwin is the first new cattle abattoir to be built in Northern Australia for 50 years. It is the first operational beef export accredited facility operated in the NT for nearly 15 years. Currently mothballed after 3 years of operation. 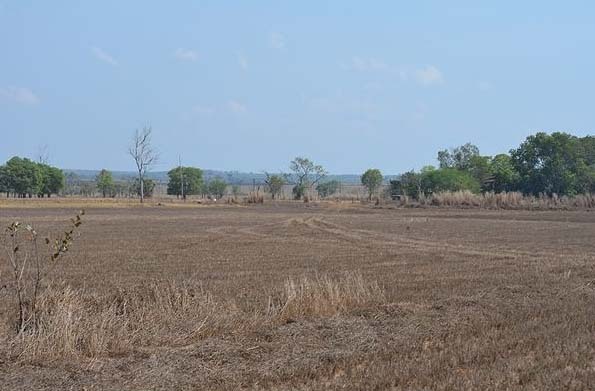 50km S Darwin, 600 ha lot, 14ha buildings, rest area used for irrigation, wetlands, ponds and buffer zone. double shift platform 7 months of year, single shift for another month and closed during wet15. Medical facilities to assist with Workers compensation costs7. Will be hot boning room (Stage 1 low cost production model), chillers and full capacity if fully developed to 225,000 head year. 260 direct and further 530 indirect jobs. Source – AACo Handout. Katherine Dec 2012. 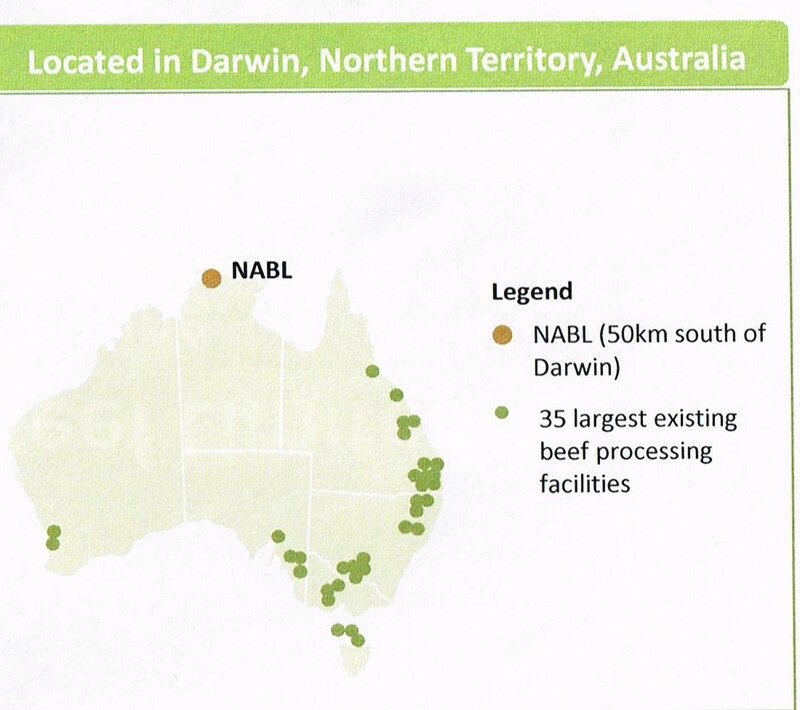 Proposed location of AACo abattoir near Darwin comparative to existing 35 largest beef processing facilities in Australia at the time. Estimate $81M to construct (paper 06.06.12), Fed gov haven’t supplied funding as yet (Jan 2013) to project1. Requires another $25M by Fed Government for road re-alignment, power, water, gas, rail, ports, Project not funded in 12/13 NT budget7. Currently one container ship per fortnight is loaded Darwin, Abattoir will require 2 container ships a week to take supply7. LE ban cost AACo $51.2M16, due mainly to land valuation write downs. Source Northern Beef Limited Phamplet. March. NT Minister for Primary Industries Kon Vatskalis announced at NTCA conference, Darwin $9M to be provided in kind by NT Govt. Markets that AACo sell their cattle to. 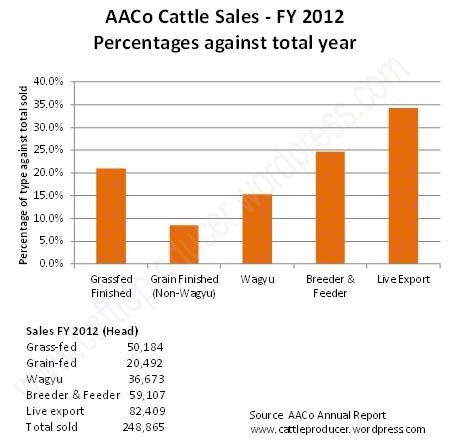 Cattle sales in percentages compared to full year sales. ACIL Tasman report ACIL_EconomicImpact_AAcoAbattoir – May 2012. RSPCA quoted as saying as soon as Darwin ab opens they will be increasing demands for LE to be shut down8. “Federal government committed to promoting economic diversification in Northern Australia”9 Joe Ludwig, Current Minister for Agriculture. 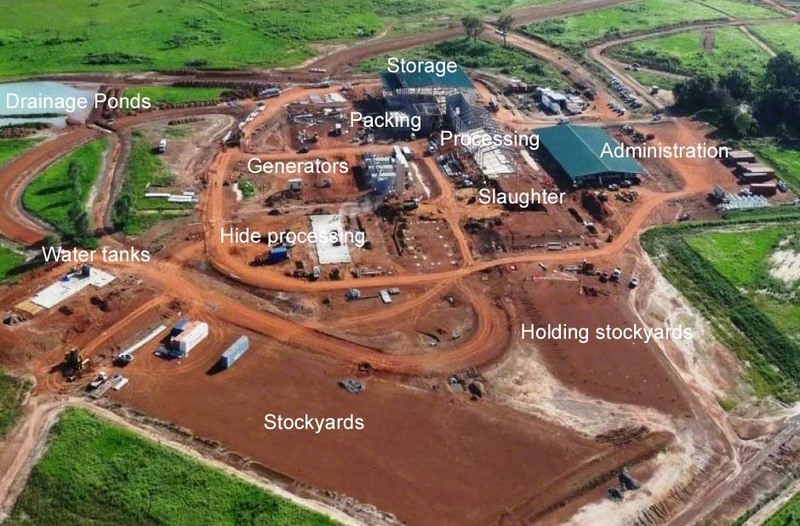 Source -The 600ha site for the AACo abattoir at Livingstone – Photo Carl Curtain. Authors Note Kilograms produced is a benchmarking technique taking into account animals born/deaths and differences in weights of sale animals to previous year. It is not simply sale animals weights. 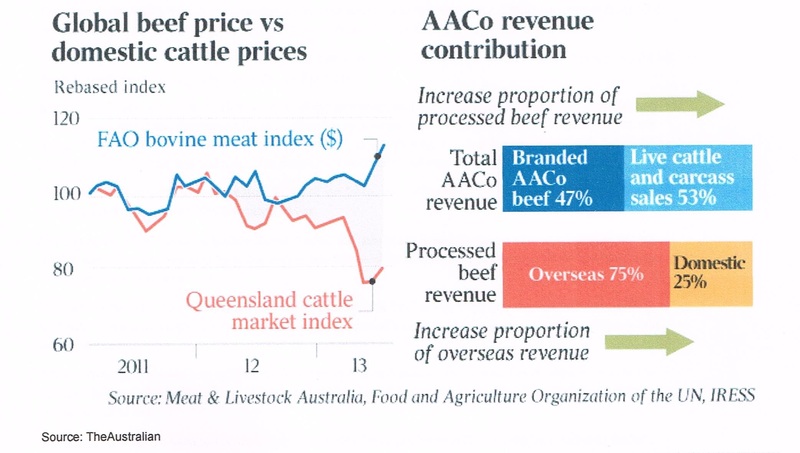 Global beef price v’s domestic cattle prices / AAco revenue contribution. Construction of the freezing section. Main building for processing of carcasses not yet constructed. March. Positions available for application at facility – Number of openings currently 100. AAco General Beef Processing staff information. Showing Livingstone beef processing facility near completion. Wagyu beef accounted for 52% of boxed beef revenue104. Same period last year had been 250,000 head104. AACo AGM. The boxed beef transformation has created a more robust business104. making strategic decisions to reduce the number of cattle sold externally104. Volume and pricing of boxed beef sales continues to increase105. 6-7 cuts from carcasses, as well as mince83. Northern Beef Performance as at 30/09/2015. Pg 11. Suggests some errors in estimates in regards to winds and magnitude of the emissions from the irrigated areas85. Mix of stock coming from AACo’s own stock and other producers86. Southern facilities need to keep operating, thus source stock further afield86. Some producers able to sell cattle in small lots that they could never sell before87. Carbeen cuts 400ha dryland sarbi and verano grass with 40ha sorghum under centre pivot87. AAco Livingstone Beef Processing facility publish 1st Community Newsletter94. Source. AACo. Livingstone Beef Operations Newsletter April 2016. April Newsletter indicating the make-up of the work force at the facility. Source AACo Website. Livingstone Operations. Accessed April 2017. Southern meatworks were paying freight after weighing at Sturt plains. October. Upgrades are made to the wastewater treatment facilities89. Built capacity of the plant was 510-520 head to be processed on a full shift89. November. Full runs commercial trial processing buffalo90. 8 head had been processed previously but additional equipment and training of staff had been required90. Actively employing local people, require more90. Majority are located in the Arnhem land92. February 10. Livingstone abattoir is temporarily shut down due to lack of stock93 because supply has been affected by heavy monsoonal rain cutting off road access to many properties93 . Workers will not receive pay while stood down93 . Longer shutdown may occur due to weather93 . Disclosure of the individual performance of the Livingstone facility had not been done before in reports of financial performance. ‘AAco blasts 457 fears, FTA lag’ Stock and Land. 18.03.13. 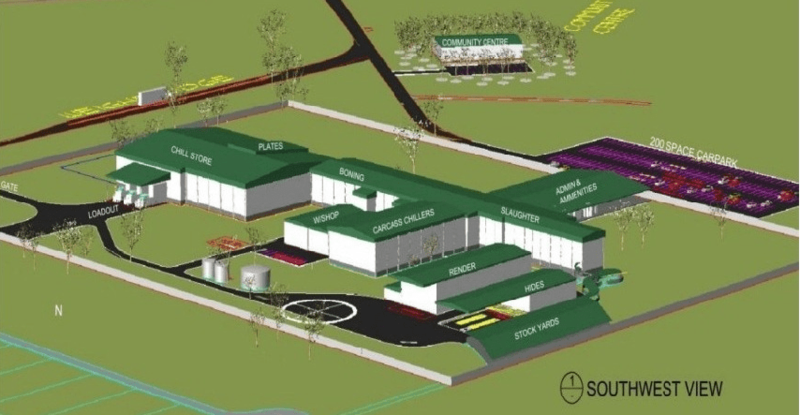 ‘Work to recommence on Darwin abattoir’ ABC Rural. 22.05.2013. ‘Farley Walks… but was he shown the door’ QLD Country Life 08.08.2013. ‘AAco may need $150M in fresh equity’ Katherine Times. 14.08.2013. ‘Departure of AAco’s CEO to be scrutinised’ QLD Country Life 15.08.2013. PDF file for report located 2012 – May. ‘Strong new AAco chief’ Stock & Land 24.01.14. ‘Kay’s Cuts: AACo & Iowa beef plant dreams become reality’ Beef Central. 06.11.14. Australian Agricultural Company Limited – Annual report 2014. ‘Ausmeat Accreditation Listing’ as at 10/05/2015. ‘Harsh weather conditions affect AACo profits’ ABC rural. 28.05.2014.